Yesterday, July 23, marked the 25th anniversary of the fire that destroyed the Worumbo Mill in Lisbon Falls, Maine. A few weeks ago, the Lisbon Historical Society presented a program about the fire. It attracted a large crowd and Dot Smith, the historical society’s secretary, put me in charge of the guest book. Not one guest escaped my eagle eye. Lisbon Police Lieutenant Dan Michel remembered being on duty that day in 1987, driving one of the department’s Volvo police cruisers down Route 196, going east towards Lisbon Falls. The Volvo cruiser experiment remains a source of town jokes to this day; many high school hot rodders can recollect the exact date and time they escaped the long arm of Lisbon law enforcement by merely punching down the pedal of their Camaros, Chevelles, or Trans Ams. In fact, when Lieutenant Michel saw the plume of nasty black smoke rising off the river that July afternoon and heard something on the police radio, he dumped the Volvo for a different cruiser. That same hot day, I was driving home from my first full-time job after college. I was working as an administrative assistant at a tree company in Portland. I didn’t like the job; I thought it was beneath me to type proposals and make tree work appointments all day. After all, it was the “Eighties” and I was supposed to be rich, famous, and jet-setting around the world with my big hair and shoulder pads. I wasn’t quite there yet, but the tree company job was helping me pay off my student loans. My parents were letting me live at home and my Pontiac Fiero got good gas mileage on the trip back and forth from Lisbon Falls to Portland. I don’t remember much about that day or why I was coming home after dark on the Route 9 side of Durham. It was before smart phones and the news moved slower; no one called or texted me with a traffic report. It had been hot and humid, very much like yesterday in New England. I had my windows rolled down because the Fiero didn’t have air conditioning. The country road seemed darker than normal and oddly smoky. Then there was the road block. A police officer came over to my car and told me there was a fire in Lisbon Falls and I would have to turn around and seek an alternate route home. Why is it I don’t remember anything else about that night? Why didn’t it seem important at the time? I don’t even remember talking to my parents about it. My grandfather was still alive; I could have asked him what he thought. I was 22 years old and lacking in perspective. I was self-absorbed. When I think about it now it makes me cry. 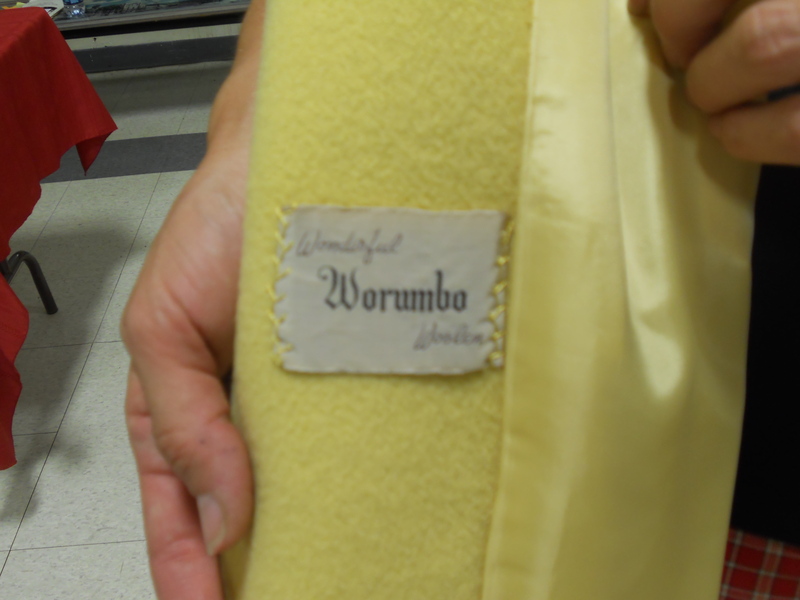 My grandfather came to America in 1924 to work in the Worumbo Mill; he worked in the dye room. He was retired by the time I was born in 1964, the same year it was announced that the mill would close. My father worked in the mill when he first got out of high school and then he got a job down the river at a paper mill. Our family friend Margaret worked in the office of the Worumbo Mill until she retired; she probably did the same kind of work I was doing at the tree company. 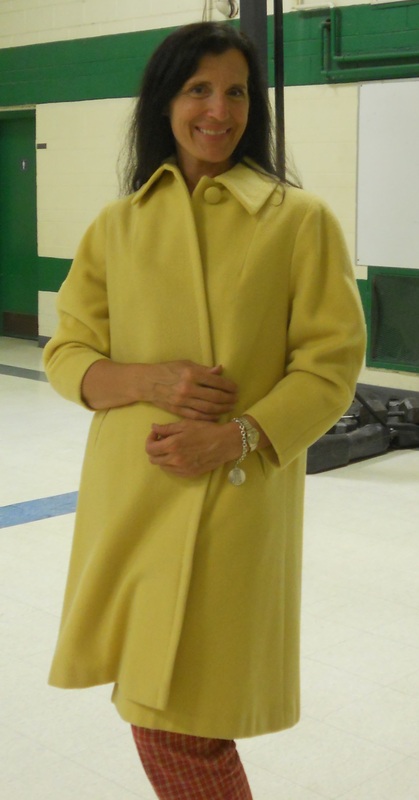 She must have been stylish; she gave this beautiful coat made of wonderful Worumbo wool to my friend Faye. Such a coat will cost you a lot of money on E-bay today. Search for yourself. When I think about it now, it’s clear that the mill had been dying long before it burned down. I think about this a lot; I think about work differently than I did in 1987. I think about the tree company sometimes, too; I learned things there, even though I didn’t realize it at the time. Typing up those proposals, I learned how power transmission lines were built, how a bucket truck worked, and why it can take days to restore power during an ice storm. I learned to respect people who did humble, grueling and important work. I might have learned it in retrospect, but I’m glad I finally learned it. My grandfather never thought he was too good to dye wool. It didn’t wear him down and he found time to farm and cut wood when he was done dying the wonderful Worumbo wool. I’m not an economist and this isn’t an economic blog, but we’ve got some financial problems in our country. There’s a fire burning and I’m not sure there’s any help coming. It’s complicated, or so they say. We’ve consumed almost all the capital other generations produced. When I wrapped myself up in Margaret’s sunny yellow coat the other night, it was like feeling the pride and dignity of those Worumbo generations around me and I could almost hear a little voice in my ear reminding me that all work has dignity. There is no work that I’m too good to do and I need to produce a little more and consume a little less. There might not be any help coming to put out this fire, but that doesn’t mean we can’t help ourselves. Let’s get to work and figure out how to produce something wonderful. What are you going to produce today? This entry was posted in Home and tagged Consumers, Lisbon Fire Deparment, Lisbon Historical Society, Lisbon Police Department, Producers, Wonderful Worumbo, work, Worumbo Mill, Worumbo wool. Bookmark the permalink. You know, there’s a minor but noteworthy link between the car you were driving, the Pontiac Fiero, and our complete lack of an auto industry today. Up in the Center, my grandfather, who had escaped a war (unlike your grandfather) was running a farm and working in the mills as well, and my grandmother worked down the hill in the mill in the Center. Come the Second World War, he was taking the trolley to Bath every day to work in the shipyards. Ask Herman what he remembers about this. My Dad took a train to Chicago after graduation, meaning to enter DeVry and learn electronics. Rufus Ham was one of his best friends, the other became a doctor and I only met him once in my life, don’t even know his name. After the Chicago trip fell apart, with Dad sitting on the factory floor reading comic books while the black men (just up from the South, mind you, this was 1949 or 1950) walked by him telling him, sotto voce, “Yeah, stick it to da man!” he came back and worked in a shoe mill. Unwilling to lose his hand in a leather stamping machine, he didn’t produce many usable lasts, leading to a revolt by the ladies getting paid by piece. In another mill, he laid tiles, growing nauseous from the fumes. Best thing that happened to him was the draft notice. He tried to join the Navy, they said his chest was too small (WTH? ), he knew enough not to join the Marines, so he signed up with the brand new Air Force. That made all the difference. The generations before us made something. What do we make? It’s not just us, it’s that way all across Europe, too. We will pay for it. As you recall, the Fiero had the engine in the rear of the car. Insane. I would ask Herman about your query, but he is currently in a reverie about his 1953 Oldsmobile Rocket 88. The Fiero was also made of plastic. My roommate at Catholic U. had one, we only drove it once a week to get groceries. When you get Herman out of his reveries, ask him about when the KKK burned a cross near the old hotel in Lisbon Center.